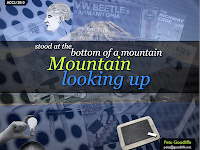 The slides from my ACCU 2010 presentation on software developers learning, poetically entitled Stood at the bottom of a mountain looking up are now available. This was a very popular presentation, and the room was packed, so thanks to all those who came along and squeezed in. I've had a lot of great feedback, so I'm glad that the talk was useful. As promised, there are a lot of references at the end of the slides that you can follow for more information. If you'd like me to give this talk at your site, user group or conference, then please get in touch.